Busy day yesterday, as I drove down to CitiField (300 miles round trip) with Gavin and Nick to catch the Mets. My attendance record stands now at 0-3, and each game fairly abysmal. This is the price I pay, I tell myself, for being in attendance for Game 5 of the 1969 World Series, when the Amazin’s won it all and later went on The Ed Sullivan Show to sing, “The Impossible Dream.” Oh well, my boys were happy. It was a sweltering day, the sun beating down on our heads, and I spent more than $40 on water at the park. Anyway, I wanted to post two photos yesterday for the holiday . 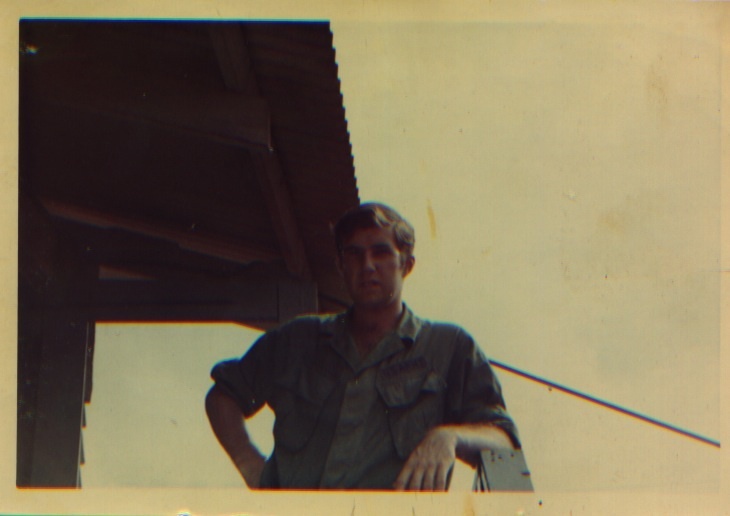 . .
My brother Bill, the second oldest in the family, served in Vietnam. I figure this shot for somewhere in 1967-68. I remember when he was over the there, and the body counts on the nightly news, a little boy wondering, hoping. When he came home, I ran and jumped into his arms. When you warm up the old scanner, it’s hard to stop. 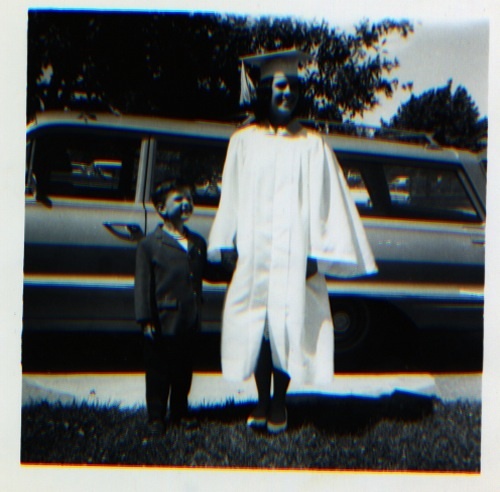 This is from my sister Barbara’s 8th-grade graduation from St. Frances de Chantel in Wantagh, NY. Back in in June, 1965, when the number one songs for the month were: “Help Me, Rhonda,” The Beach Boys; “Back in My Arms Again,” The Supremes; “I Can’t Help Myself (Sugar Pie Honey Bunch),” The Four Tops; and “Mr. Tambourine Man,” The Byrds. I used to be two years old. Go figure. 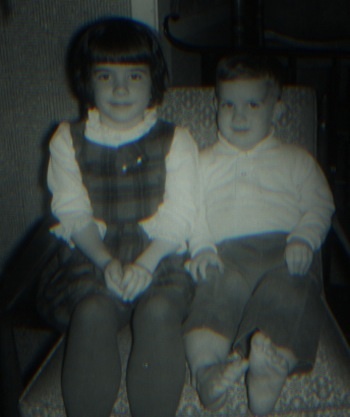 This is from April, 1963, and I’m next to my sister Jean, age 5, going on 6. She was something with those straight bangs. On school visits, I’ll sometimes joke that there are no photos of me, because nobody bothers taking pictures of Kid #7. There’s truth in that, of course, but I’ve found some scattered old photos, too. Usually I’m standing next to somebody else, or a brother’s new car. 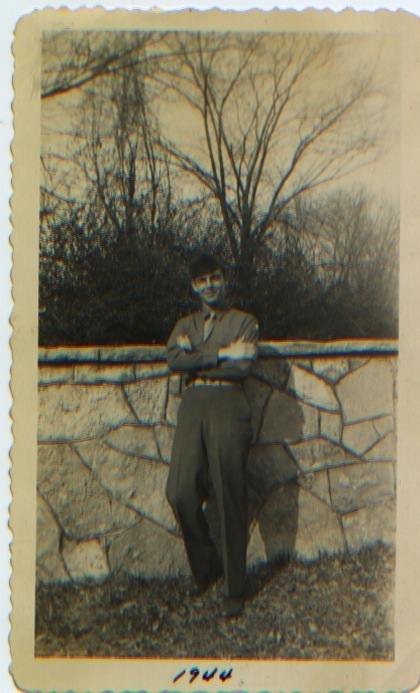 These photos have become my small treasures.